Cape Verde , officially the Republic of Cape Verde, is an island country, spanning an archipelago of 10 islands located in the central Atlantic Ocean, 570 kilometres (350 miles) off the coast of Western Africa. The islands, covering a combined area of slightly over 4,000 square kilometres (1,500 sq mi), are of volcanic origin and while three of them (Sal, Boa Vista and Maio) are fairly flat, sandy and dry, the remaining ones are generally rockier and have more vegetation. The previously uninhabited islands were discovered and colonized by the Portuguese in the 15th Century, and became important in the Atlantic slave trade for their location. he islands’ prosperity often attracted privateers and pirates, including Sir Francis Drake, a corsair (privateer) under the authority of the British crown, who twice sacked the (then) capital Ribeira Grande, in the 1580s. The islands were also visited by Charles Darwin’s expedition in 1832. The decline in the slave trade in the 19th century resulted in an economic crisis for the islands. With few natural resources, and without strong sustainable investment from the Portuguese, the citizens grew increasingly discontented with the colonial masters, who nevertheless refused to provide the local authorities with more autonomy. A budding independence movement culminated in 1975, when a movement originally led by Amílcar Cabral (who was assassinated on 20 January 1973) then passed onto his half-brother Luís Cabral, achieved independence for the archipelago. The country has an estimated population (most of creole ethnicity) of about 500,000, with its capital city Praia accounting for a quarter of its citizens. Nearly 38% of the population lives in rural areas according to the 2010 Cape Verdean census; about 10.6% lives below the poverty threshold, according to the world bank data |2011|, and the literacy rate is around 85%. Politically, the country is a very stable democracy, with notable economic growth and improvements of living conditions despite its lack of natural resources, and has garnered international recognition by other countries and international organizations, which often provide development aid. Since 2007, Cape Verde has been classified as a developing nation. Tough economic times during the last decades of its colonization and the first years of Cape Verde’s independence led many to migrate to Europe, the Americas and other African countries. This migration was so significant that the number of Cape Verdeans and their descendants living abroad currently exceeds the population of Cape Verde itself. Historically, the influx of remittances from these immigrant communities to their families has provided a substantial contribution to help strengthen the country’s economy. Currently, the Cape Verdean economy is mostly service-oriented with a growing focus on tourism and foreign investment, which benefits from the islands’ warm climate throughout the year, diverse landscape and cultural wealth, especially in music. The sandy Viana desert on the island of Boa Vista Before the arrival of Europeans, the Cape Verde Islands were uninhabited. The islands of the Cape Verde archipelago were discovered by Italian and Portuguese navigators around 1456. According to Portuguese official records the first discoveries were made by Genoese born Antonio de Noli, who was afterwards appointed governor of Cape Verde by Portuguese King Afonso V. Other navigators mentioned as contributing with discoveries in the Cape Verde archipelago are Diogo Gomes, Diogo Dias, Diogo Afonso and the Italian Alvise Cadamosto. In the 16th century, the archipelago prospered from the transatlantic slave trade. Pirates occasionally attacked the Portuguese settlements. Sir Francis Drake, a British corsair, sacked Ribeira Grande in 1585. After a French attack in 1712, the town declined in importance relative to nearby Praia, which became the capital in 1770. 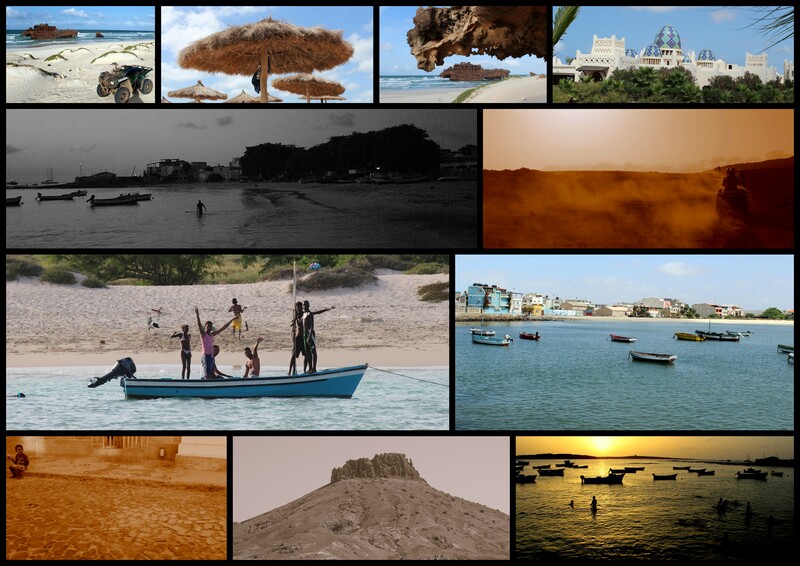 With the decline in the slave trade, Cape Verde’s early prosperity slowly vanished. However, the islands’ position astride mid-Atlantic shipping lanes made Cape Verde an ideal location for re-supplying ships. Because of its excellent harbour, Mindelo (on the island of São Vicente) became an important commercial centre during the 19th century. also that the Portuguese had intended for the islands as a colony of Portugal, but upon arrival discovered that the island. had no fertile land or practical use for colonization, so they used the islands as a slave trade and check point for trade. In 1951, Portugal changed Cape Verde’s status from a colony to an overseas province in an attempt to blunt growing nationalism. In 1956, Amilcar Cabral, and a group of fellow Cape Verdeans and Guineans organised (in Portuguese Guinea) the clandestine African Party for the Independence of Guinea and Cape Verde (PAIGC), which demanded improvement in economic, social and political conditions in Cape Verde and Portuguese Guinea and formed the basis of the two nations’ independence movement. Moving its headquarters to Conakry, Guinea in 1960, the PAIGC began an armed rebellion against Portugal in 1961. Acts of sabotage eventually grew into a war in Portuguese Guinea that pitted 10,000 Soviet bloc-supported PAIGC soldiers against 35,000 Portuguese and African troops. By 1972, the PAIGC controlled much of Portuguese Guinea despite the presence of the Portuguese troops, but the organization did not attempt to disrupt Portuguese.